Ter Adun has been one of those heroes that has kind of taken a back seat to a lot of Heroes and is generally considered a Tier 5 Hero. 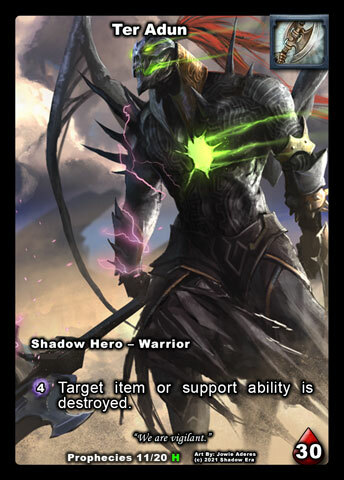 This is due to his Hero ability being non-impactful as far as helping to reclaim a board, having many games or matchups where the ability is irrelevant and there are many other Item Destruction outlets of varying types available to all heroes. Shattered Fates and Lost Lands brought us some really cool tricks and toys for Ter Adun and I put them together in this build. Ter Adun is a Ravager and his hero ability is very synergistic with the Ravager Alignment side revolving around breaking things. 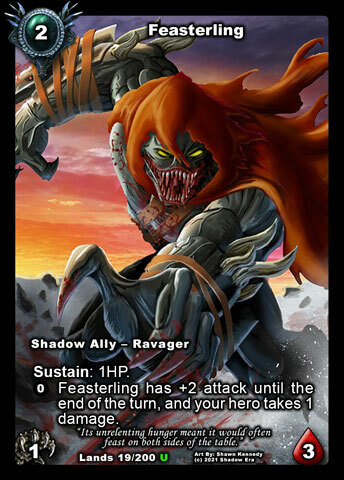 Additionally Ravagers have a great combination both Aggressive and Defensive allies and some really cools tools to buff your allies as well as receive an additional benefit when destroyed. Ter Adun usually has some trouble with the early game so we use a heavy number of 2cc allies to help ensure we can get an early board presence and help keep some damage off the hero. 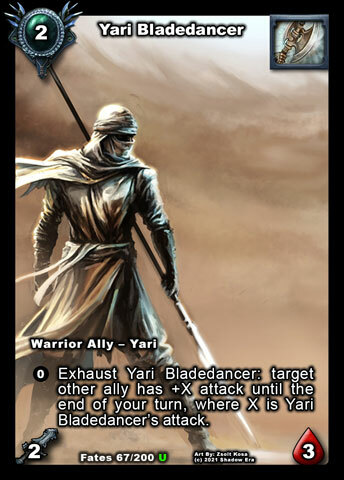 Feasterling and Yari Bladedancer fill that role and both have great synergy with a follow up Crown of Ages which can buff attack of both allies by +2. Feasterling is the preferred Turn 2 play because with the Crown buff he can get his attack up to 5hp which can deal with every 1-3cc ally except for Caged Savage. 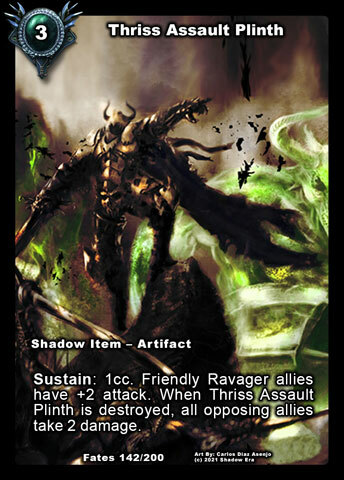 Thriss Assault Plinth can also buff Feasterling on Turn 3 but will self destruct at the end of turn which can be a good combo from taking out Rush decks. Plinth will not buff Bladedancer. 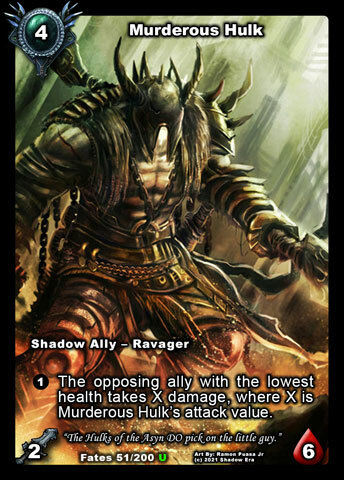 Bladedancer has some good synergies with Ravagers as his base attack is 2 and he can shift his attack to another friendly ally for the turn so he really provides a good secondary Turn 2 option. After your above descripted Turn 3 options, you have many secondary options you can also follow up with. 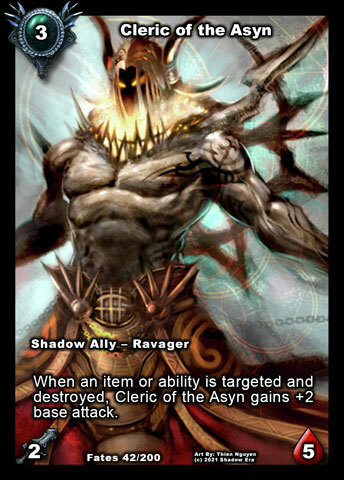 Cleric of the Asyn is great for advancing board presence and generally preferred vs setting up Blood Frenzy. We would like to get a Cleric down somewhere in Turns 3-5 generally in a position where we can combo a destruction same or next turn, however he is excellent turn 3 for his 2/5 survivability stats. Cleric is going to be a key threat in this particular deck so comboing destruction to accelerate his attack growth will be key in keeping the opponent focused on him. They key ways we are looking to combo destruction with Cleric (and are also good on their own), are mainly using a combination of Crown of Ages, Thriss Assault Plinth, and Thriss Crucible and then using self destruction techniques of Ter Adun, Meltdown, Ravager Zealot and Thriss Demolitionist. The key combos are going to revolve around Crucible, Meltdown and Zealot. Thriss Crucible is quite possibly one of the best new tools that Ter Adun has acquired. It is able to destroyed by Ter Adun (if needed) and creates a readied 3/3 ally which bypasses various summon blockers (Haste, Traps, Voice of Winter, etc). This is good because it can be surprise damage which can go to control board or damage the hero. 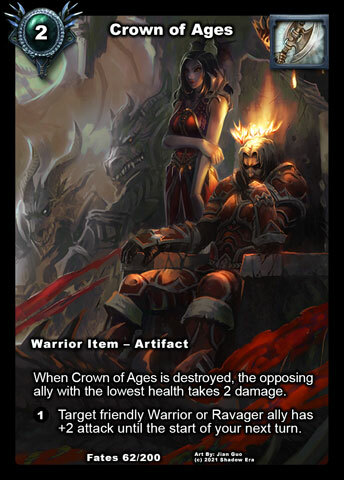 Crucible’s existence has brought a seldom used card Meltdown into being very usable card. Crucible + Meltdown is an excellent Turn 5 play and allows Ter Adun to wait longer before needing to play Blood Frenzy. 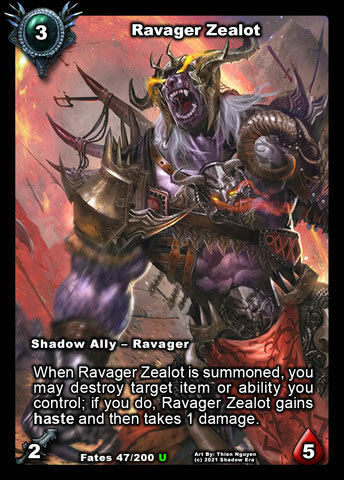 In addition, Crucible also combos very well with Ravager Zealot, creating a different but excellent synergistic pairing. This dual threat, while not overly dominating (low health), can be greatly enhanced by the decks various attack boosters. 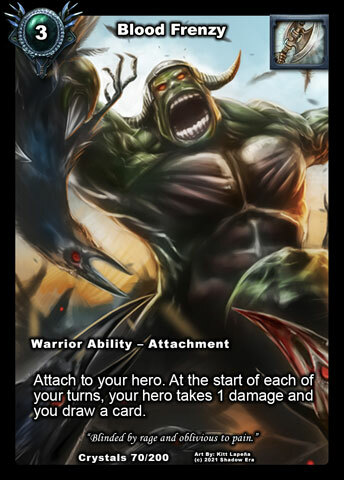 Murderous Hulk is an excellent inclusion to the deck for his survivability and flexibility to deal with stealth options. Hulk helps to keep damage off your hero and if he sticks can become quite troublesome for your opponent and his board especially with other attack boosters present. While I am currently running 4 copies he could be reduced to 3 copies to create tech space. Thriss Demolitionist is another option that opponents generally do not want to see. Demolitionist has some great uses in creating another big body on the board, but also helps to limit opponents control tools. 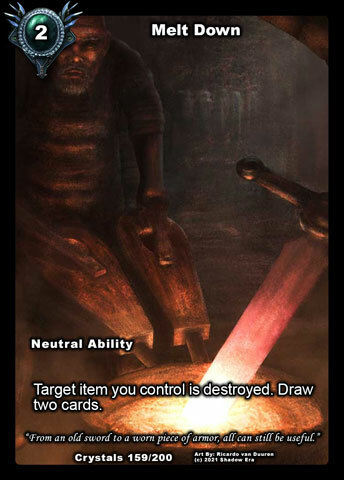 This is especially important for removing attachments which Ter Adun cannot get to, which could mean freeing up a Cleric of the Asyn which has been receiving buffs under a Crippling Blow type card. 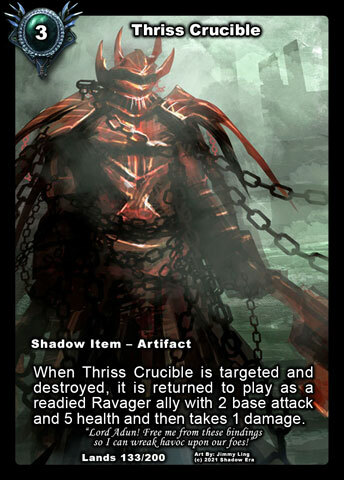 This also creates some secondary support to Ter Adun’s ability, as well as another option to destroy Thriss Crucible. Blood Frenzy can draw you ton of cards, but is used as a secondary option to Meltdown so generally becomes a later play for me. This will help to keep some damage off the hero, but can be played early if you are not able to put down your board allies early as described above. 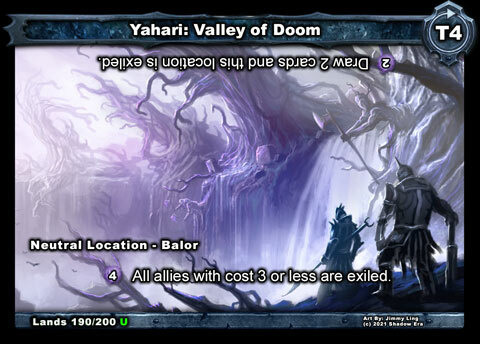 Yahari: Valley of Doom is a fairly excellent card for this deck. In addition to providing an early rush prevention tool, it is also a fairly good alternative hero ability usage. This can be comboed with the Crucible + Meltdown/Zealot combo from wiping a board and then creating a good board presence. Valley of Doom can be a tricky card so I do not always tend to use it as high health and potentially aggressive allies can additionally get me back a lost board. This whole group of cards could be tweaked/removed based on meta/personal preferences. 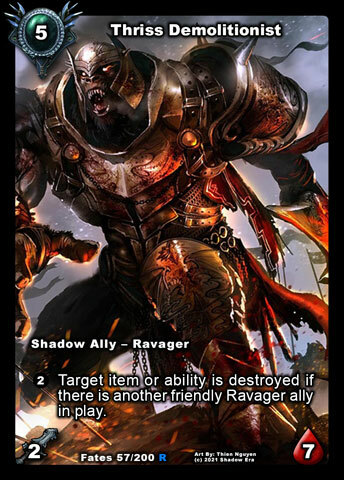 Tagged alignment, destruction, lost lands, Ravager, Shadow era, ter adun, tribe. « Rethinking 4x in 40 – The Logic Behind Monster Decks.